I hope that everyone had a wonderful three day weekend. My Friday ended on a bad note, but the rest has done me good and I'm hoping to keep my attitude as positive as it can be for a pessimist such as myself. My goal for this week is to remember that while other people may be all about the drama, I don't have to respond in kind. I never really was that great of an actress, anyway. It just so happened that I got to come home in the middle of the day this past week, and as I stepped into the door, I had to take a picture. Little Maisy, who isn't really all that little anymore, found something to occupy her day while we were out earning our paychecks. She was so proud of her accomplishments! 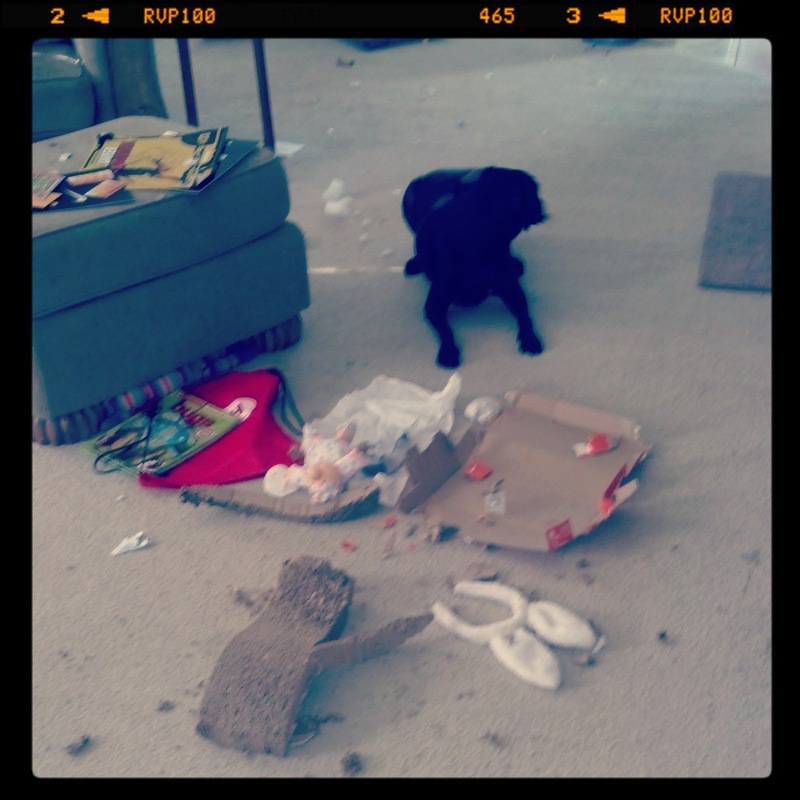 If there's ever a need for a cardboard shredding dog, she is definitely in the running. 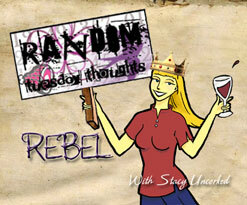 I have absolutely NO idea where the rabbit ears came from, and I've been scratching my head about it ever since. I hope this doesn't mean that she ate the Easter Bunny. Zane came home from school Friday talking about cake. Great--I am all on board with discussions of that particular treat. 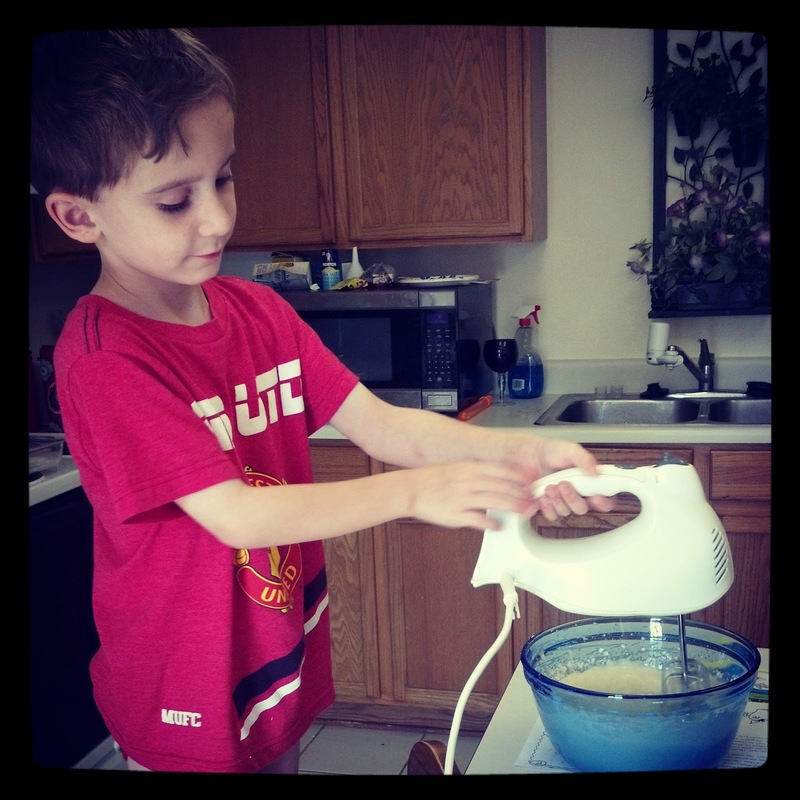 Except Zane wanted ME to bake a cake. Upon further conversation, I learned that Zane's class read a story about cake that Friday. His teacher, being unaware of my firesetting skills, sent home a recipe for a Piglet's Poke cake and frosting, with a note that we could make the cake "together". I was game, until I looked at the recipe. What the heck is baking powder? Is that the same as baking soda? I wasn't sure, but I knew that we did not have either in the house at the moment. The frosting was going to be iffy as well. Zane was so disappointed. I remembered that I had purchased a cake mix last year! A cinnamon cake. Who cared that the cake was made by Duncan Hines? Cake is cake! We did have the eggs and water and butter needed for the recipe to be complete, so Zane and I got to work. We dispensed with the frosting--none of us are big frosting eaters in our house. The cake turned out just fine, and has been disappearing at an alarming rate. My husband and I have been having an argument discussion about what is appropriate for Zane to watch. He likes to watch Ghost Adventures with me, and my son and I have discussed what's real and what is not in staggering detail(and yes--most reality shows are not 'real'--they are staged/edited for entertainment, even his favorite show, Call of the Wild Man). Zane isn't bothered in the least by the ghost show. He wasn't bothered by seeing The Lord of the Rings movies. He IS bothered by the evening news, which told him that a tornado had touched down in the Midwest this weekend. That made him have a nightmare about tornadoes and our house. Zane understands that most of what he sees on television is not real, and he is just fine with that. It's the real stuff that bothers him. I hate to tell him, but the real stuff bothers me, too. Go visit Stacy. She should be arriving at her destination in the Pacific Northwest soon, and back to her regularly scheduled program soon. 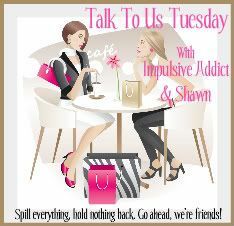 And Shawn and Impulsive Addict for Talk to Us Tuesday. They are actually posting again, so that's a real treat! My kids watch all kinds of shows. I find now a days that THEY tell me if they think it's appropriate or not. They do not watch the news. And if I can help it... politics. The news is by far the worst show! (Except for the Daily Show and Colbert) Ooooh, cake! Hooray!! !